YPSA jointly with Cox’s Bazar municipality arranged a sharing meeting on “Tobacco free Cox’s Bazar City: our Responsibility” on 29th May 2018 at the conference room of Cox’s Bazar Municipality. Mr. Md. Mahabubur Rahman Chowdhury, Mayor (Acting) of Cox’s Bazar municipality presided over the meeting where Mr. Noam Hossainn Prince, Upazilla Executive Officer of Cox’s Bazar Sadar Upazilla was the chief guest in the meeting. Mr. Helal Uddin Kabir, Councilor, Mrs. Homaira Begum, Councilor, Mrs. Samim Akter, Focal point officer of Cox’s bazar municipality, Mr. Rasel Chowdhury, Secretary of Cox’s Bazar Municipality, Mr. Khairuzzaman, SI of Sadar Police Station, SI of Tourist police, Mr. Safaiet Hossen, OC of Fire service, Mr. Tarun Barua, Sanitary Inspector of Civil Surgeon office; Mr. Mir Mostafizur Rahman, Manager of Hotel Shaibal, President of Bus owners association, District Education officer, Journalists, NGO representatives, youth leaders were present in the meeting. Ms. Nasim Banu, Team leader of Tobacco control project presented the key note paper on Tobacco Free Cox’s Bazar city. 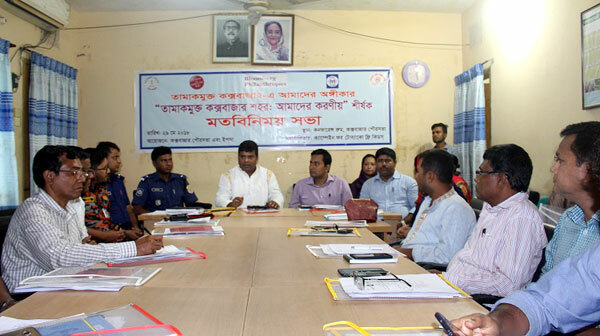 Upazilla Executive officer of Cox’s Bazar Sadar Upazilla declared that the local administration would provide all their support to enforce the tobacco control law. Mayor of Cox’s Bazar Municipality said that the Cox’s Bazar municipality would be more stricter for ensuring tobacco free public place. Ms. Khaleda Begum, Team Leader of CEVEC project of YPSA moderated the open discussion. In the open discussion, all the participants commit to work together for implementing the tobacco free initiative and provided some suggestions and directions to ensure the Tobacco free Cox’s Bazar City.